En Masse Entertainment, a player-driven publisher focused on delivering fun and innovative online games, announced today it is adding all-new dungeons with dynamic new game modes, epic bosses, and elite gear to its MMO, TERA: Rising for PC. Scheduled to launch on July 8, 2014, the Wounded World update is packed with new content, enticing players to join four vast new worlds. They will be introduced to a variety of treacherous scenarios– including The Abscess, a hellish home of unworldly creatures. With the addition of these four dungeons come dangerous twists and turns for players to maneuver their way through. Along the way, they will be able to pick up some of the most unique accessories ever featured in the game including the Deathstain, Vandraul, Koleogg or Rally sets – and will be able to defeat the mightiest foes for rare loot. Key Features: Fight your way through waves of enemies and a fatal boss in order to put a stop to Risalke’s plan to free the deadly prisoner, Lakan. Description: Hidden in the Great Rift since before the Age of Mortals lies a secret prison, built for one inmate: the reptilian god, Lakan. But now an ambitious sorceress is about to stage the world’s most dangerous prison break. Key Features: Defeat the creatures of the ghilliedhus’ primal forest. Rescue Banyakas’s ward spirits— or be forced to battle them later. Win Deathstain items, molten tokens, and more. Description: A patriarch has been driven to madness by a primeval monolith. As he and his people begin to unravel, mortals everywhere must beware the dire consequences. Key Features: Cut and burn your way through the bizarre creatures erupting from the Abscess, and the mutated bosses that lead them. Description: The Great Rift is a wound in the world—and part of it has become infected. Seek the source, and burn it out…before it spreads! Key Features: Join the explorer, Vandraul, as he recruits adventurers to help secure the near-mythical Floating Stone, from the clutches of the gargantuan beetle-beast Koleogg. Description: Battle along one of two paths, through the path of hostile villagers and sentries or a succession of BAMs, to reach the insidious Yativio corpse-flower, the giant hornet Vesporax, the dreaded Koleogg, and finally the fabled Floating Stone. 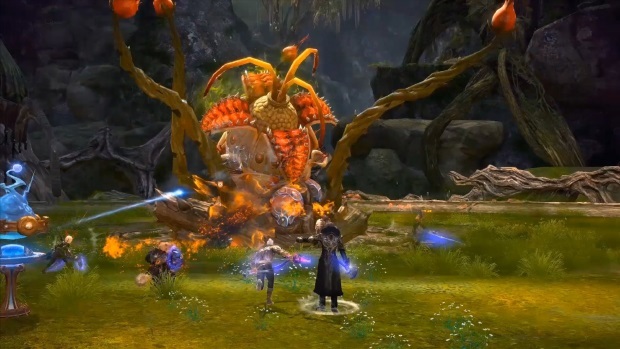 The new dungeons for TERA: Rising are set to launch on July 8, 2014.